So [you] is the subject for January, since (as mentioned in the previous post) I'll be back-tracking to January in addition to my March photos, since I started this whole challenge a month late! So you'll get two photos for the price of one. Not sure if it's obvious or not, but I'm not really a fan of photos of myself, so I decided to have this as my [you] photo. I also liked that the mirror gave it a fish-eye effect! And you can see that I actually do use our 'real' camera! Since I'm notorious for taking photos a. with my phone and b. at work, I thought it was appropriate to start March's photo with just that. 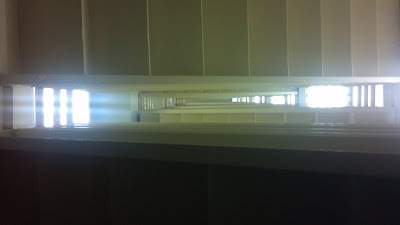 So this is looking [up] in the stairwell at work.